In this article I would like to share with you two natural ways to gain weight quickly and easily. The fact is that to gain weight you don't need supplements, you don't need pills or powders, all you need to focus on are proven and tested principles and without wasting too much of your time let me share them with you. It does not matter whether you want to gain or lose weight - nutrition is the single most important thing. You see, both fat loss and weight gain is all about energy in and energy out. When you are trying to lose weight you want to make sure that your daily energy output is greater than your daily energy input, whereas when you are trying to gain weight you by all means want to make sure that your daily energy input is greater than your daily energy output. To gain weight, to make your body grow you need to give your body way more energy (calories) than it actually needs. I know that this probably sounds a little bit confusing, but all you need to do is to simply use one of the thousands of caloric calculators that are available online, figure out your caloric needs and then add extra three to five hundred calories on top of your actual caloric needs. 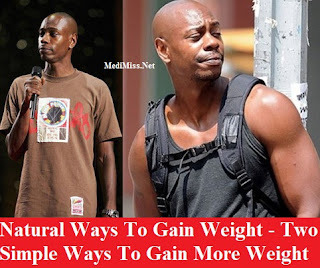 When trying to gain weight you need to be really careful because if you will fail to exercise all of the extra energy that you will get from your new diet will be quickly converted into fat and instead of gaining high quality lean muscle mass you will be gaining useless body fat. To prevent this from happening I highly recommend for you to start lifting weights. Simply start slowly and start training at least three times per week. Here are some tips for you to get started. Follow a body split workout plan and train large muscle groups on different days. During your workouts focus on big compound exercises such as barbell squats, bent over rows, deadlifts, military press and so on. Do no more than twelve repetition per set and never do more than four sets per exercise. Do no more than four exercises for large muscle groups like chest, back or legs and do no more than two exercises for smaller muscle groups like biceps or triceps.